Despite the prevalence of social media for sharing your photos, you might actually want to print photos from within Windows 10. You can print them using the Photos app. 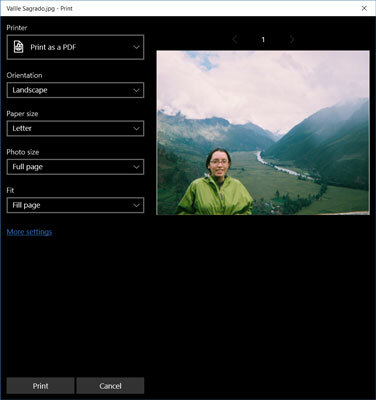 In the Photos app, select one photo using a click or tap to display the photo at full screen. Select the More button on the right side of the app bar. Select Print. The Print window appears, as shown here. Select your printer. If you have a printer but it doesn’t appear in the list, you may not have selected a photo or you may have two or more photos selected. The Photos app doesn’t have an option for printing more than one photo at a time. Select a printer. Note the preview. Select the Print button. Here’s a handy keyboard shortcut that works in any app: Press Ctrl+P to open the Print window straightaway.